The final chapter in Kratos' story of revenge, better known as God of War III, begins precisely at the moment we last saw the very angry Spartan, on the back of the Titan Gaia as she climbs Mt. Olympus. God of War III does not throw the player directly into battle immediately from the "start" screen, as previous demos have. Instead, we're treated to a short cinematic that starts with Kratos snapping to no one in particular—"My vengeance ends now! "—and a pre-rendered, Zeus-narrated intro, one that should get God of War fans back into the god-killing revenge swing of things. You'll be introduced to many of the bad guy gods you'll face on the climb to the peak of Olympus—Hades, Helios, Zeus, et al.—as they stare down at the encroaching Titans, but it's Poseidon who makes himself your first target. The god of the sea leaps from the mountain's highest point, turning himself into a watery missile, smashing into the sternum of one of the Titans, plunging it into a body of water below. Watery tentacles shoot forth from the spinning whirlpool in which the Titan fell, bursting upward, snatching Titans from the sheer face of Olympus, and grabbing Gaia, stopping her climb. So begins God of War III's gameplay and, as previously noted, one of the game's wildest moments. As Gaia struggles with the watery tendril that has ensnared her, Kratos must dispatch a group of undead underlings, an opportunity for players to re-familiarize themselves with the Greek god's twin arm-blades. Eventually, Kratos makes his way up Gaia's arm, engaging Poseidon's liquid leviathan in battle. At the business end of that tentacle beast is a horse-headed monster made of water, with a half-dozen or more crablike claws that slam down on Kratos. The battle is a not-too-difficult sequence comprised of slashing, smashing and quick time event button mashing—at one point the action flips upside-down, with Kratos hanging from the underside of Gaia's arm—interspersed with perspective changes and camera sweeps that underscore just how massive the scope of God of War III is. The battle between Gaia, Kratos and leviathan continues—leading at one point into Gaia's wounded chest cavity for a bit of block-shifting puzzle-solving—until, eventually, you face the massive Poseidon himself. This version, looking far less human than the one who leaped from the peak of Mt. Olympus, is a collection of tendrils and a trident wielding, crustacean armored gigantic embodiment that looks far more intimidating. He'll shock Kratos with electric bursts and stab at him with his giant weapon. Along the way, God of War III breaks up the blockbuster action and wild combat with less impressive stuff, climbing vine-covered walls, pulling levers to shift elevator platforms, swinging from platforms by way of arm-blade, slaying more low-level minions and eviscerating Centaurs. Okay, the dump of innards from the sliced open bellies of those horse-men is still kind of impressive. There's still plenty of platforming and chest-opening in-between the more glorious set pieces; it's not all pure adrenaline filled fisticuffs. The action is stunning, bordering on epic, if you don't mind the adjective. The visuals, from the watery effects that spray from each spawn of Poseidon to the impressive use of depth of field blur to the far more interesting camera work, give God of War III more graphical cred than just another God of War running in better resolution. The version we played looked more graphically spectacular than previous hands-on demos. But it was the moments, including one more that's potentially spoiler-warning worthy, that reignited my interest in God of War. If you haven't yet been convinced by God of War III's offerings thus far, consider the final battle between Poseidon, in lowly flesh and blood form, and Kratos. Here, the camera shifts between third-person and second-person, as Poseidon watches while Kratos beats him to death. It's bloody and brutal—and this is your last chance to look away—employs smart use of the PlayStation 3 controller. After a long quick time event sequence, a vicious series of circle and square button presses, the final kill, from Poseidon's view point, asks players to push in L3 and R3. Kratos does his own thumbwork on poor Poseidon, gouging out the eyes of the sea god, the screen turning black. Kratos casts the body aside, ready to move onto the next deity. 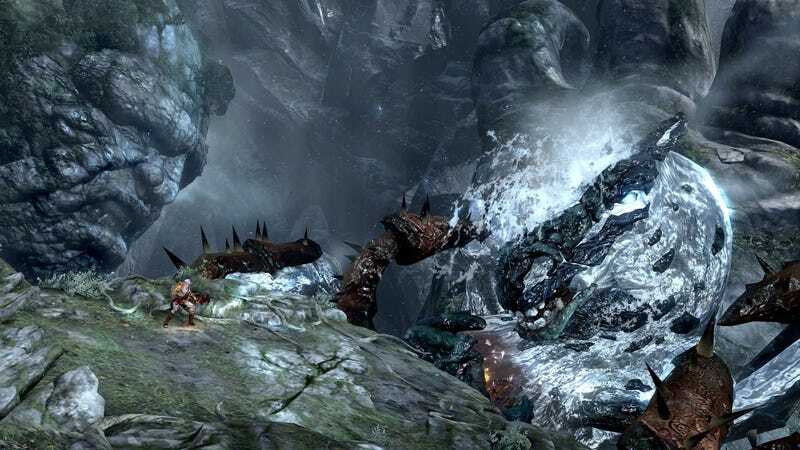 That's the first boss fight in God of War III and whatever we can tell you in text likely won't match up to the playable experience. Truthfully, this is more God of War, a high-definition, high production value spin on the tried and true gameplay. But if that's the first 20 minutes of what God of War III has to offer, we can't wait to see what the next 10 hours has in store.